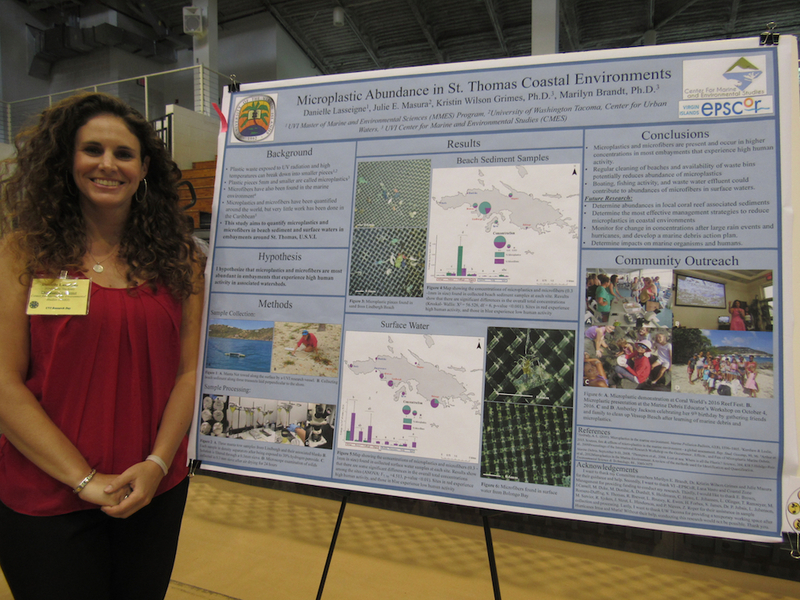 UVI graduate student Danielle Lasseigne’s research studied the abundance on micro-plastics in the waters around St. Thomas. 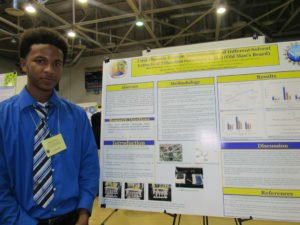 The seventh Annual Research Day at the University of the Virgoin Islands gave many graduate and undergraduate students the opportunity to share extensive research they have conducted on a topic or problem they are passionate about. On Friday, the Sports and Fitness Center of UVI’s St. Thomas campus was filled with displays exploring such topics as local flora, marine life, 3D mapping, cellular biology, social services in the Virgin Islands, and more. Though setbacks and budgetary constraints caused by the 2017 hurricane season threatened the occasion, the Research Day Committee was able to organize an informative event. Frank Mills said, “The driving resilience that pervaded the campuses in our efforts to fully recover made itself evident went President (David) Hall unhesitatingly expressed his desire for the event to take place in April 2018,” said Frank Mills, chairman of the Research Day Committee. After the welcome, students from Ivanna Eudora Kean High School, Charlotte Amalie High School, Montessori School, and Antilles School were able to peruse the displays, participate in roundtable discussions, and even enter the pop-up planetarium that was available. There was no shortage of displays exploring phenomena in the territory’s environment. 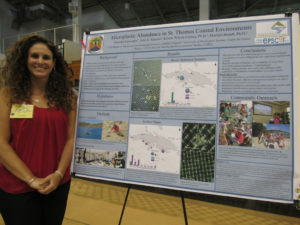 Graduate student and marine and environmental science major Danielle Lasseigne studied the amount of plastic on the beaches of St. Thomas in her presentation titled, “Microplastic Abundance in St. Thomas Coastal Environments.” Her research used density separation techniques to filter plastic from sand and water collected in eight locations. Her results showed that the concentration of microplastics and microfibers was higher in areas of high human activity. She proposed that access to trash cans and a managing staff influenced the concentration, as Lindbergh Bay had the highest concentration out of all the locations that were studied. “I have seen the concentration of microplastics and microfibers quantified globally, but I have not seen it done here. I am hoping that my research can expand into studies on whether fish and coral reefs are eating them, as well as more community outreach to increase recycling and beach cleanups,” Lasseigne said. “A cellular automaton is an arrangement of cells whose conditions depend on the conditions of their neighbors. We identified arrangements of cells to use, set deterministic rules that determined the relationship between each cell, then observed how each cell transformed. This method can be used by scientists to determine whether diseases among corals will spread, which is important because a lot of marine life depend on them” Hanley explained. Heidmann tracked the behavior of six Mutton Snapper at nighttime and daytime for two months, paying close attention to when they foraged for seagrass and when they sought shelter in coral reefs. Her results showed that unlike many other species of snapper, Mutton Snapper typically feed all through the day rather than just at night. “Mutton Snapper are ecologically and commercially important here, and they are often fished to a point where the population is in decline. If we can identify which habitats they use and when, plans can be made to protect their habitats and maintain long-term ecosystem health.” Heidmann explained. UVI undergrad Hairol Breton with his presentation studied the phenolic content of Old Man’s Beard. “Phenolic compounds carry antioxidant properties, which can protect the body from free radicals,” Breton said while explaining the significance of his findings. Research technician for the Center for Marine and Environmental Studies Sydney Nick had a table set up to demonstrate sediment coring. The research she conducted tested for contaminants and blue carbon concentration in the local mangroves. Her research measured the housing-cost burden (amount of income put towards housing costs) for renters living on each island before the hurricanes, as well as the change in rent for rental properties after the hurricanes. Roundtable discussion topics included communication technology, culture clashes when speaking in dialect, resiliency, and invasive species.